There are more than 200 cancers that can affect a human. There are cancers which are not fatal also fatal one are there. 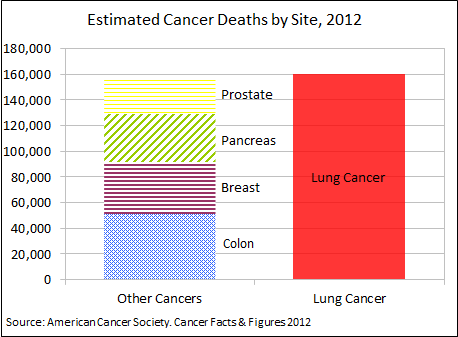 The most fatal and deadliest cancer of all cancer is "LUNG CANCER". It has engulfed 160,000 lives alone in United States America which is far more than combining the deaths caused by colon, breast, pancreas and prostate cancer. These facts are shocking and the death rate due lung cancer is increasing day by day. There are various type of lung cancers and before the treatment of lung cancer it is necessary and foremost task to determine the type of lung cancer. There are mainly four types of lung cancers that decide the further set of treatment that is to be used while treating lung cancer. 1. Small cell lung cancer :- Small cell lung cancer is caused by the smoking, exposure to asbestos and radon. It accounts for about 20% of total lung cancers. This affects the inner parts of lungs and it is further of two types namely limited and extensive. Limited has an access to only one side of lung and extensive affects both sides of lungs. Most of the cases are extensive and there is very less chance of surgery in this type of cancer though radiation therapy and chemotherapy gave better results. In spite of this the survival rate is pretty much low as about less than 20%. 2. Large cell lung cancer :- Large cell lung cancer is found in 10 % of the victims having lung cancer and it is called so because of its large round shape of its cells when seen under microscope. It affects the outer side of the lungs. Its prediction can be done by the signs of prolonged cough and blood coming out with the cough. 3. Squamous cell lung cancer :- This type of lung cancer constitute about 30% of total lung cancer and it affects the inner parts of lungs and its common symptoms are cough from a long time blood while coughing and breathing problem. Incident of squamous cell lung cancer is decreasing after the coming up of filtered cigarettes. 4. Adenocarcinoma lung cancer :- This type of lung cancer is associated with non smokers and they constitute more than 50% of the cases of lung cancer. It constitute a large group of women. Its symptoms are hard to recognize and mostly recognized at time it is diagnosed. Its symptoms may be shortening of breath, fatigue, prolonged chronic cough and blood coughing. On basis of these four types of lung cancers, further treatment is recommended by the oncologist. hello, homeopathy is also very effective treatment method for cancer treatment in India. What happens when you quit SMOKING ??? Detection and Diagnosis of Lung cancer. Managed by www.CancerResearchCentre.org. Powered by Blogger.